Bring on a Game Seven!! The Kansas City Royals made that a certainty, with authority, as young Yordano Ventura shut down the San Francisco Giants Tuesday night at Kaufmann Stadium. 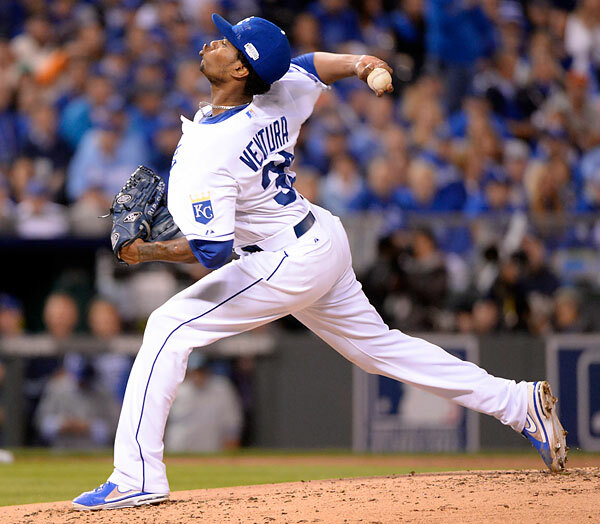 OCTOBER 28 – KANSAS CITY, MO: Yordano Ventura #30 of the Kansas City Royals pitches against the San Francisco Giants during Game Six of the 2014 World Series at Kaufmann Stadium in Kansas City, Missouri on October 28, 2014. (Photo by Ron Vesely/MLB Photos). 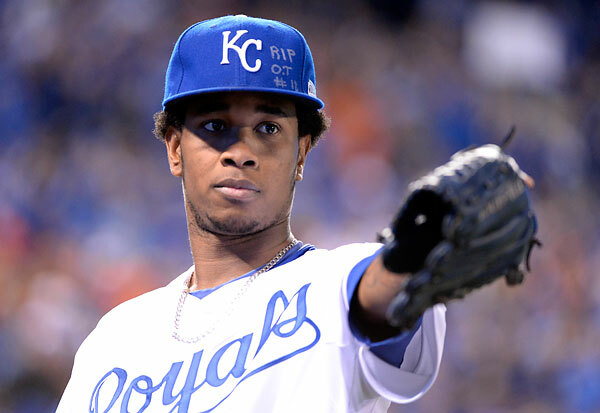 OCTOBER 28 – KANSAS CITY, MO: Yordano Ventura #30 of the Kansas City Royals looks on against the San Francisco Giants during Game Six of the 2014 World Series at Kaufmann Stadium in Kansas City, Missouri on October 28, 2014. Ventura paid tribute to the recently deceased Cardinal rookie Oscar Tavares on by writing a tribute on his cap. (Photo by Ron Vesely/MLB Photos). A seven run second inning didn’t hurt either! 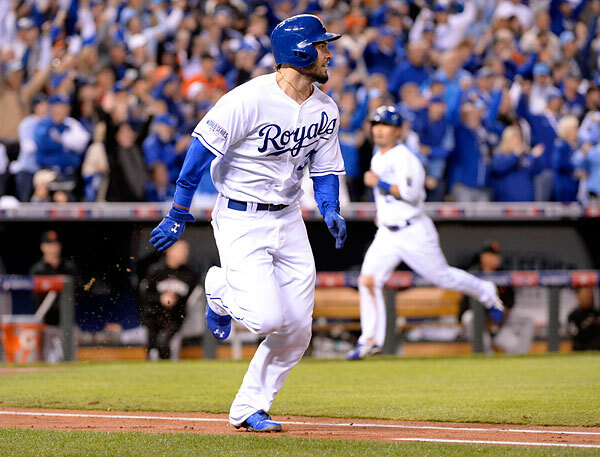 OCTOBER 28 – KANSAS CITY, MO: Eric Hosmer #35 hits an two-RBI double in the second inning, scoring Nori Aoki #23 (background) against the San Francisco Giants during Game Six of the 2014 World Series at Kaufmann Stadium in Kansas City, Missouri on October 28, 2014. (Photo by Ron Vesely/MLB Photos). With the suspense gone early, in a game devoid of pictures, we all wished the old “slaughter rule” would be implemented by outgoing Commissioner Bud Selig so we could all get back and rest up for the deciding Game Seven. 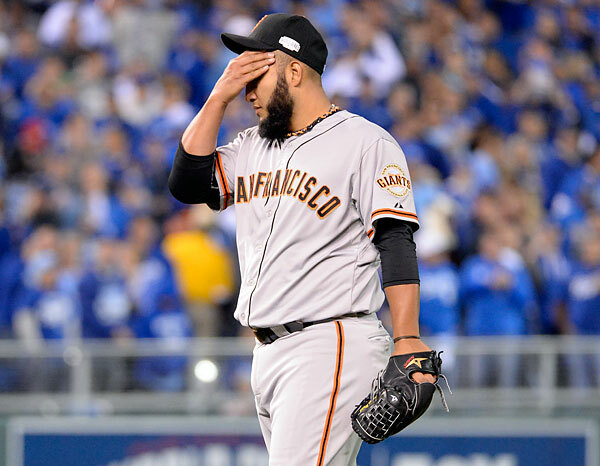 OCTOBER 28 – KANSAS CITY, MO: Yusmerio Petit #52 of the San Francisco Giants reacts during the second inning of Game Six of the 2014 World Series against the Kansas City Royals at Kaufmann Stadium in Kansas City, Missouri on October 28, 2014. (Photo by Ron Vesely/MLB Photos). It seems everyone covering The Series is sick… I have NEVER seen so many people coughing, hacking, and suffering from laryngitis in one place than I have the past few days covering the Series. 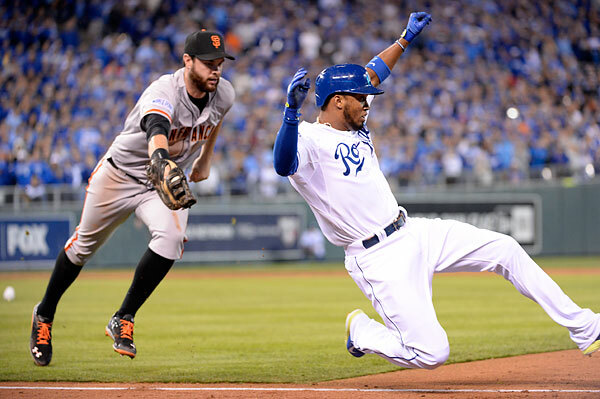 OCTOBER 28 – KANSAS CITY, MO: Alcides Escobar #2 of the Kansas City Royals is safe at first with a single as Brandon Belt #9 fails to make the tag in the second inning during Game Six of the 2014 World Series at Kaufmann Stadium in Kansas City, Missouri on October 28, 2014. (Photo by Ron Vesely/MLB Photos). Trying to escape from the sickly has been challenging. I’m on the cusp. It’s crazy! I even heard the Royals are suffering from these symptoms as well. If that’s the case, they sure didn’t show any ill effects from it last night! 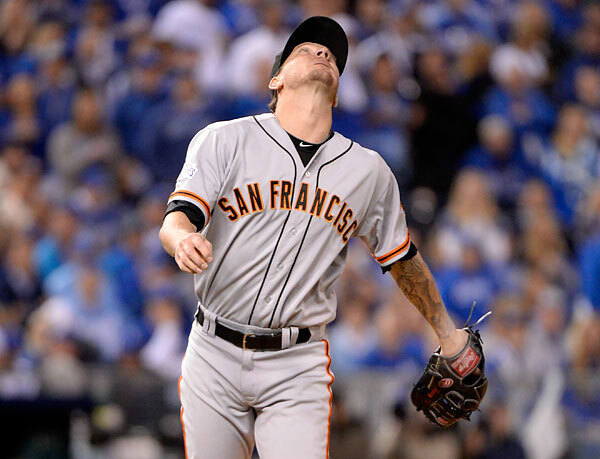 OCTOBER 28 – KANSAS CITY, MO: Jake Peavy #22 of the San Francisco Giants watches the flight of a fly ball during the second inning of Game Six of the 2014 World Series against the Kansas City Royals at Kaufmann Stadium in Kansas City, Missouri on October 28, 2014. (Photo by Ron Vesely/MLB Photos). Jake Peavy was hit hard early, and the usually reliable Yusmerio Petit wasn’t so reliable on this night as the Royals pounded out a seven run second inning to send the Royals faithful into a loud and fun filled tizzy that didn’t stop until hours after the game. 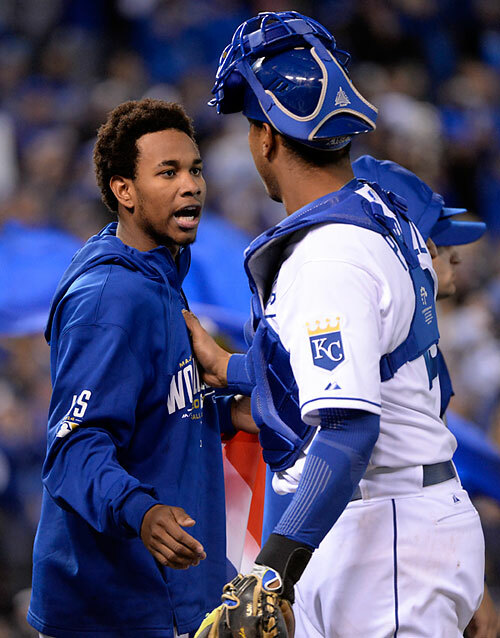 OCTOBER 28 – KANSAS CITY, MO: Yordano Ventura #30 celebrates with Salvador Perez #13 of the Kansas City Royals after Game Six of the 2014 World Series against the San Francisco Giants at Kaufmann Stadium in Kansas City, Missouri on October 28, 2014. (Photo by Ron Vesely/MLB Photos). There is nothing like a one-game, winner take all, “mano e mano” showcase like a Game Seven! This entry was posted on Wednesday, October 29th, 2014 at 12:37 PM	and is filed under Assignments. You can follow any responses to this entry through the RSS 2.0 feed.